Hello there, Donist World denizens, and welcome back. I’m Donist, and I am joined by our CFO Obie (my friends’ Boston terrier) and by our marketing director / administrative assistant / party planner / Spring Break specialist Tulip (my dog, Obie’s sister). 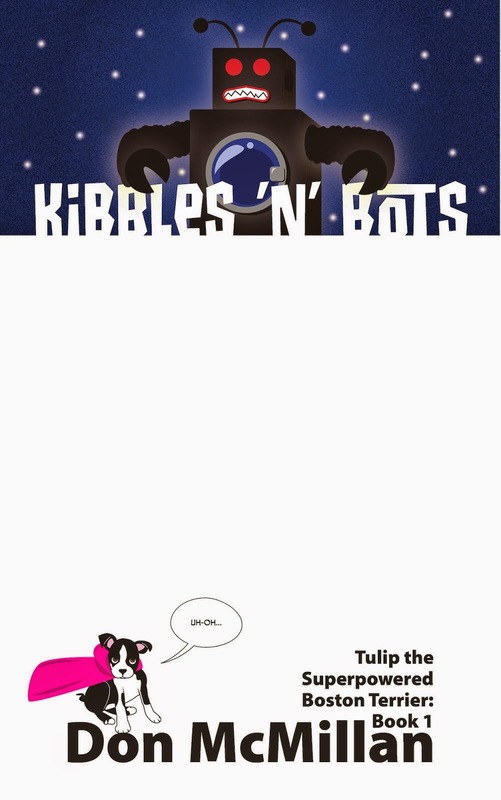 Today, we are preparing to launch into Spring Break along with Amy the intern (my wife), and we are struggling to finish up some stuff so we can take things relatively easy over the coming week; I’m hoping to get closer to the 50% mark of the next Kibbles ’N’ Bots book. I am also preparing for Obie to come stay with us starting next Thursday, which means added Donist World synergy and collaboration here at the corporate office (my mom’s basement)…and probably some added headaches as Obie attempts to usher in some wacky, new management style. For now, grab a couple tacos and kickin’ ginger brew and have a look at this week’s heavenly comics. Thank you for reading. Chew #47 - Written and lettered by John Layman, illustrated and colored by Rob Guillory, color assists by Taylor Wells, published by Image Comics. Where’s Poyo? That’s the question being asked around the FDA office, and unfortunately, John Colby knows the answer. Meanwhile, as Tony Chu waits for his daughter to finally awaken in the hospital after her grievous injuries at the hands of The Collector, Tony and D-Bear move to investigate a truck transporting a megatriceratops head. Shocking newsflash…D-Bear is actually really good at being a detective. Honestly, after 47 issues, nine trade paperbacks, four hardcover “Omnivore” editions, one monstrous “Smorgasbord” edition, a script book, a Revival crossover, multiple reprints of earlier issues, two awesome “Poyo” specials (here and here), and glowing month(ish) praise here on Donist World with every new issue, are you really all that surprised to see Chew pop up again? Well, you shouldn’t be. 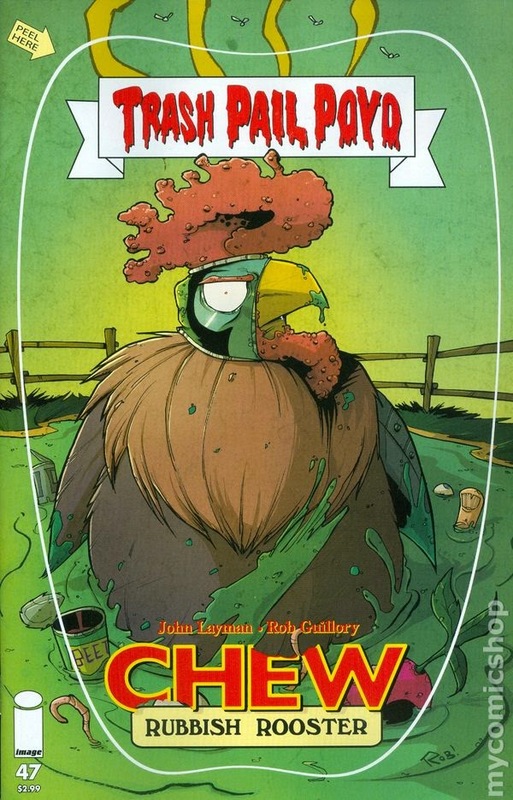 As far as heavenly comics go, Chew soars the skies with the deadly luchador chickens…errrrr, I mean eagles…and continues to be the most unique book on the stands. Anyhow, with that out of the way, and a full expectation of being punched in the nu-nus by the next shocking event, I need to emphasize that this is a predominantly humorous comic. Sure, much-loved characters have died or been severely messed up, but at the core you will find yourself wiping away tears of laughter more than sadness. With Chew, you also need to take the time to investigate every detail of every panel, as Guillory and Layman have so many subtle jokes hidden in the artwork and the lettering; you might miss them if you breeze through too fast. You also need bright lights and some squinting on some of the tinier details, but you will be well-rewarded for doing so. Okay, you have all the different available formats that you need in order to read this fantastic series as listed above. Yes Chew can be gross, yes it can be offensive, but more than anything it is always entertaining, and remains one of my most anticipated month(ish) reads. The series is far along, but it is never too late to catch up, especially with the bargain priced first trade. Chew is great. Chew is good. Let us thank Layman and Guillory for our food…errrrrr…comics. HIGHLY RECOMMENDED! 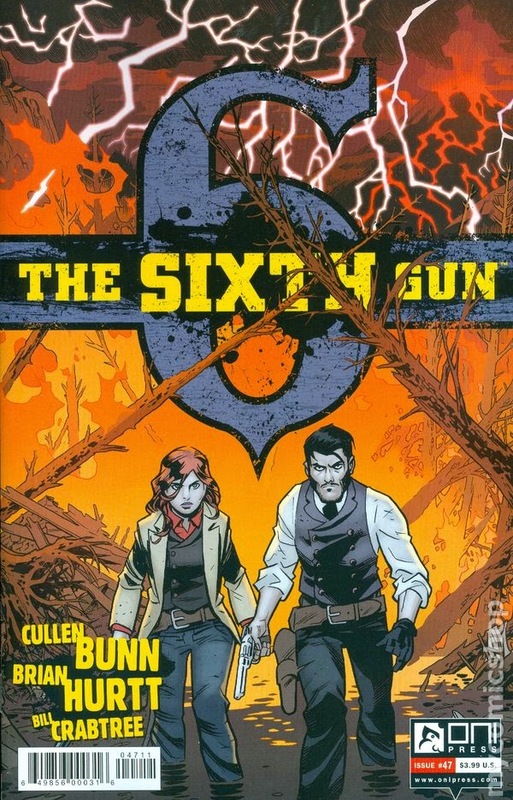 The Sixth Gun #47 - Written by Cullen Bunn, illustrated by Brian Hurtt, colored by Bill Crabtree, lettered by Crank!, designed by Keith Wood, edited by Charlie Chu, published by Oni Press. The end is nigh, as Griselda the Grey Witch and Jesup prepare to take the final step in recreating the world in their image. Becky, Drake, and Nidawi have one last chance to stop the destruction. Three long-lost characters return. <sigh> Thus concludes the penultimate arc. After the insane roller coaster ride seen last issue, the creators take a moment to assess the damage, and place all of the remaining characters into place for the last ditch effort to save / change the world. I’m not going to spoil any of the returned characters other than Nidawi, but for the remaining two, I have been wondering what happened to one, and I’m glad to see the other tying up a story thread from a while ago. Bunn and Hurtt’s supernatural Western continues to be exciting and shocking as we are brought to the terrible moment dreaded since the first few issues. Key characters — including some minor characters long thought gone — look to complicate matters for our heroes, and I honestly have zero idea of what is going to happen next, which is a great place to be. With little action, Hurtt again excels at bringing the drama and the emotion of Bunn’s dialogue, with Crabtree’s colors setting the dire mood providing yet another beautiful issue of this great comic. We’re in the homestretch, denizens, and as sad as I will be to see this series end, I cannot wait to get my hands on the next issue. If you’ve been reading The Sixth Gun since the beginning, then you know exactly how I feel. If you came late to this series, then you can still quickly catch up with the seven available trades, and see what happens when the old West meets The Lord of the Rings. HIGHLY RECOMMENDED! 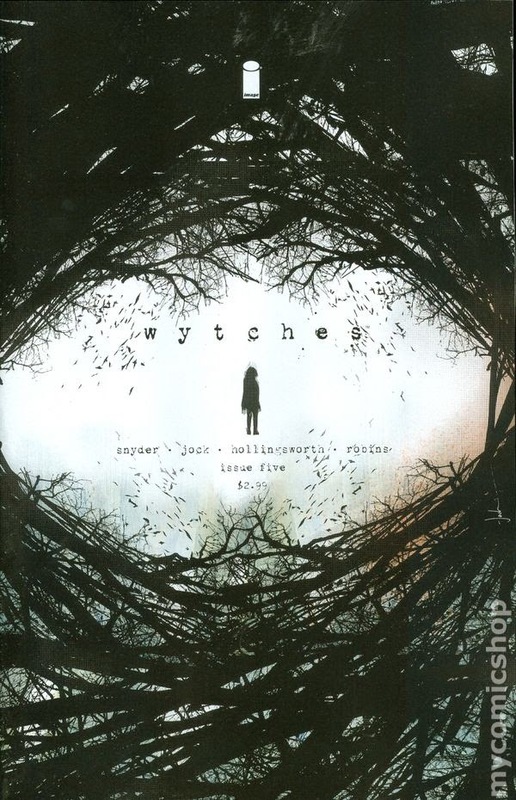 Wytches #5 - Written by Scott Snyder, illustrated by Jock, colored by Matt Hollingsworth, lettered by Clem Robins, edited by David Brothers, published by Image Comics. Not only have the wytches taken Charlie’s daughter, but their wicked magic has caused Charlie’s wife, Luce, to forget the girl even existed. Charlie’s finally reached his breaking point, and nothing’s going to keep him from getting his girl, Sailor, back. Egads, this book is creepy! I mean that in the best possible way. As I’ve said for each of the previous reviews, Wytches is more about the psychological / emotional side of horror as opposed to the often unimaginative gross-out horror that seems to have taken hold a few years back. Snyder takes us deep into that fearful place of not just being alone (Sailor in the wytches’ den, and Charlie trying to save her) but also having the rest of your world actively working against you. The story alone is unnerving, but when combined with Jock’s beautifully severe lines and Hollingsworth’s otherworldly colors, you are transported deep into the woods to the tree with the ginger root growing from it like cancerous tumors. And then you drop in. Jock’s shadows and the dwindling lights set chill-inducing scenes, providing you just enough of a view of the horrifying wytches as they feed, deep within the bowels of their grotesque den. Much of these demonic creatures is left to the imagination…which makes each panel in the sequence all the more terrifying. My one gripe is that there are a couple places where I was unsure as to what was happening, but they were not that big of a deal. 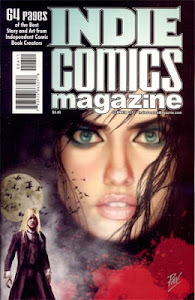 Although I’ve stated that there were moments in past issues where some of Hollingworth’s unique — and cool — use of patterns in this series were nearing excessive, that is not the case here. A more subdued version of the patterns accompany the flashback scenes, while the textures become more pronounced and sharper in contrasting colors as Charlie descends into the wytches den for a glittering effect that makes the magics at work very clear. I read a headline somewhere online that said issue six would conclude Wytches, and my heart shrunk a little believing that would end the book. I’m glad I misunderstood. The next issue, looks to conclude the story with Charlie, Sailor, and Luce, but the series will return to cover new ground this summer. Thank goodness. If you like horror books that stick with you for days afterwards, to the point that when you take the dog out late at night, you end up paying extra attention to the trees, the shrubs, the shadowed recesses, then this is the book for you. HIGHLY RECOMMENDED! 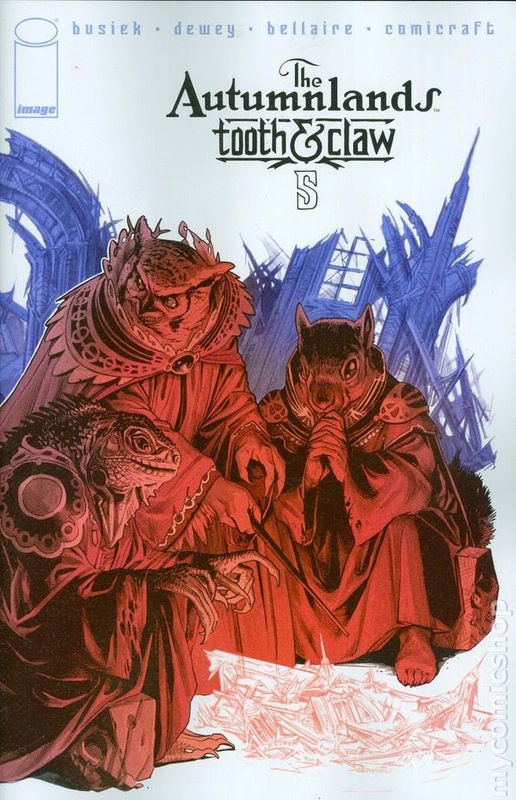 The Autumnlands: Tooth & Claw #5 - Written by Kurt Busiek, illustrated by Benjamin Dewey, colored by Jordie Bellaire, lettered and designed by John G. Roshell and Albert Deschesne of Comiccraft, published by Image Comics. Everyone with a degree of influence has machinations at work: Sandorst the owl seeks to take charge; Goodfoot wants to pit everyone against each other, while robbing them all blind; even the Champion, Learoyd has plans that he refuses to divulge. Lady Gharta and Lady Affa are arrested, and a meeting between Learoyd and Seven-Scars has everyone on edge, as Dustan begins to question his hero’s motives more and more. The Autumnlands: Tooth & Claw continues to be the best fantasy comic on stand. 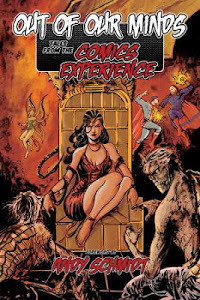 Busiek quietly builds upon his world and further develops the characters while elevating the tension that looks to erupt next issue. Although we see more of what drives each of the main characters, there’s still plenty left for us to uncover in later issues, which I am completely excited to see unfold. Dewey’s art is simply fantastic with the volumes of life and emotion he gives to each of the animals in the series, from the main recurring characters all the way down to a one-panel-appearance lizard guard. But, it is his scenes with Dunstun that steal the show, with Sandorst and Goodfoot coming in at a close second. On another huge positive note is the single panel appearance of a Boston terrier guard that made Tulip and Obie howl in excitement…please bring this character back and make him / her a recurring character! I have no idea what is going to happen in this meeting between Seven-Scars and the Champion, but I’m excited to see it all go down; I suspect it’s not going to go all that well. Do you like stories with anthropomorphic animal characters? Do you like fantasy and magic? Do you like both mixed with a hint of sci-fi that is gorgeously written and illustrated? Then look no further than the tremendous The Autumnlands: Tooth & Claw. HIGHLY RECOMMENDED!